This gem laboratory in a practical case can be operated anywhere. 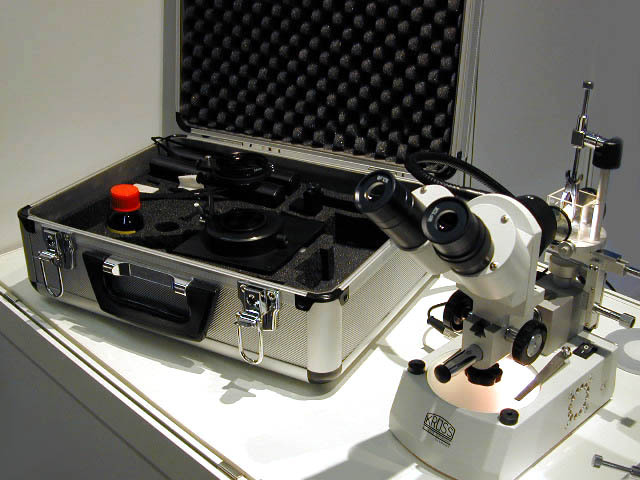 A cold light source is built-in and gives excellent light intensity, dark field illumination, transmitted and reflected light to illuminate the diamonds/gems, the refractometer, the spectroscope and polariscope. 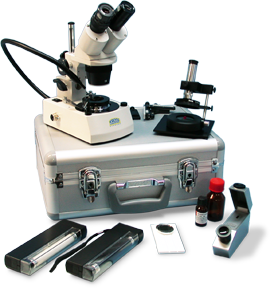 Microscope KSW 4330-2K, spectroscope 1501 with spectroscope holder, polariscope, conoscope,cuvette table with cuvettes, darkfield, cold light source, stone holder, daylight, UV-longwave, gem refractometer ER 6040, bromine naphtalene, Andersonliquid.